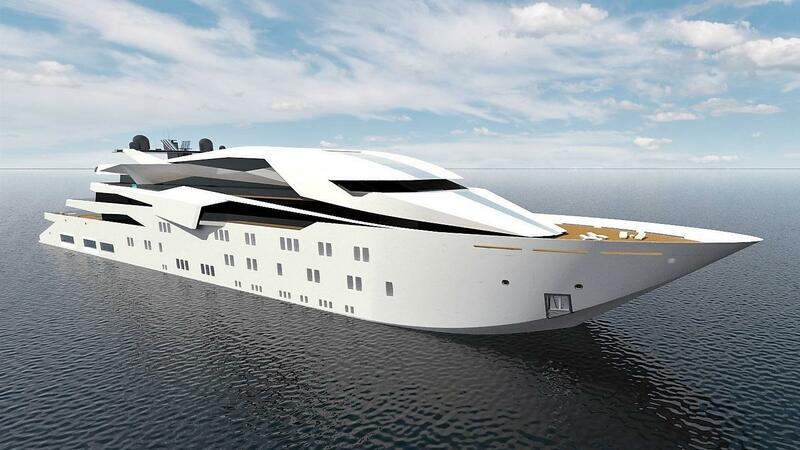 French studio YXXI Yacht Design has revealed its latest concept, the 127 metre Project #4. Project #4 boasts multiple options for sport on board. The superyacht sundeck can be converted into a sports court, suitable for tennis, basketball, football, badminton or golf, while the walkaround bridge deck can be used as a 200 metre running track. On yacht there is a superyacht swimming pool. The pool is situated on the aft deck and it measures 12 metres long by eight metres wide and 2.75 metres deep. Glass sidewalls ensure plenty of natural light will filter down into the beach club below. Accommodation for up to 30 guests is split across 15 staterooms, including an upper deck owner’s suite, complete with its own private spa and terrace, eight bridge deck double cabins and six further doubles on the main deck. The entire lower deck is dedicated to crew and technical areas, with enough room for a staff of 46 people. Other key features include a 30-seat movie theatre and a superyacht helipadon the foredeck with a maximum diameter of 11 metres. YXXI Yacht Design adds that Project #4 could be driven by either a diesel-electric or traditional diesel propulsion system supplemented by an electric azipod, with both offering the option for silent cruising. After three successful launches of imposing Giga-size superyacht, Benetti celebrates three new additions to its fleet. From 26th February until 2nd March 2019, the Dubai International Boat Show is promising to be bigger and better than ever!